Thanks to research on flatworms, you may someday regrow that lost limb. 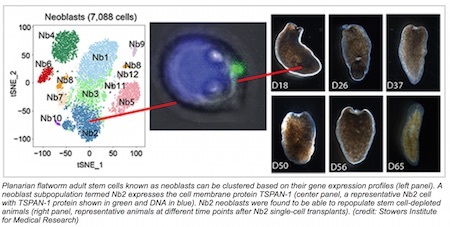 “We have enriched for a pluripotent stem cell population, which opens the door to a number of experiments that were not possible before,” says senior author Alejandro Sánchez Alvarado, Ph.D. “The fact that the marker we discovered is expressed not only in planarians but also in humans suggests that there are some conserved mechanisms that we can exploit. My favorite early reference to the idea that some special technique could regrow lost limbs is the Atlotl/Gibiril Regimen from The Godmakers by renowned sf author Frank Herbert.